Originally posted on betting.betfair many years ago, no longer displayed, so I thought I'd repost it for the benefit of those who regularly ask about it. All images from the old interface, the principles remain the same! One trade you may consider on horse racing markets is to 'lay the field at odds-on'. Take a look at how many horses get beaten these days at odds-on in-running - it means punters are over-reacting and losing, so why not be on the other side of that and profit from it? To create a profitable book based upon laying a number of horses at a pre-determined price during the race. 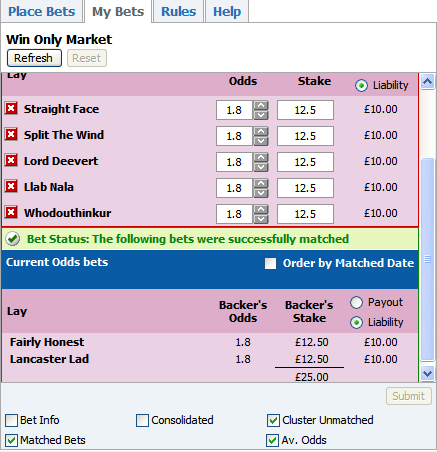 To have a profitable book your combined lay bets need to exceed 100%. Therefore if you lay 2 horses at 1.8 (55%) you would be a winner. Should you decide to lay @ 3.0 (33.33%) you will need to lay at least 3.1 horses at that price during the race. The price you choose will vary depending on your research or testing (keep liability small). Factor you may want to consider include distance of the race, flat or jumps, hurdles or fences, ground or size of field. Below are three easy steps, using an example of a race at Brighton in which orders were entered to lay the whole field should any of them trade at 1.8 in running. Go to a horse race. 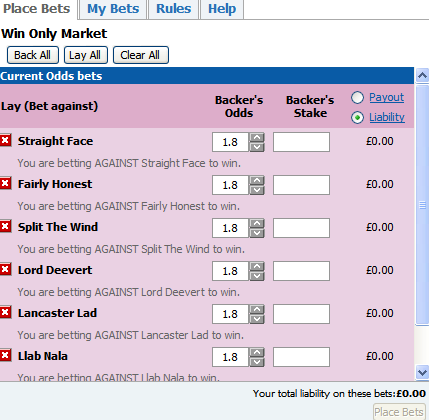 Click on the 'Place Bets' tab on the right of the market and select 'Lay All'. Enter the price you want to lay each of the selections and then click 'liability' - the word NOT the dot. Enter the amount you are prepared to lose on the market (in this instance £10) and click 'Ok'. This will automatically calculate how much you need to lay each selection to risk your liability. Remember you will only pay out on one horse, therefore the worst result is £10 (if two horses dead-heat your loss would be £5 x 2 as winnings are halved). 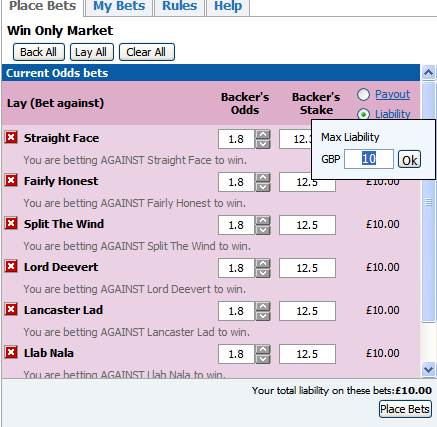 Before placing your bet just check that your liability for each selection is £10. Having submitted the bet, if placing the orders before the race has started, you will need to click 'keep' and submit to ensure they are not erased when the market suspends at the beginning of the race. There are a number of different scenarios that may occur. 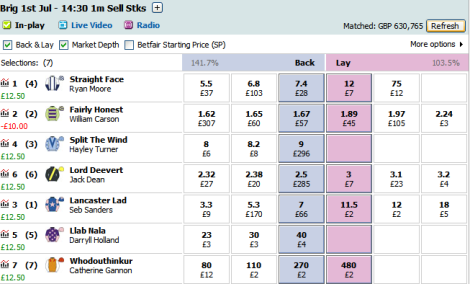 Scenario 1 - The winner is the only horse to trade through 1.8 in running and you had laid it to lose £10. In this instance, Fairly Honest. 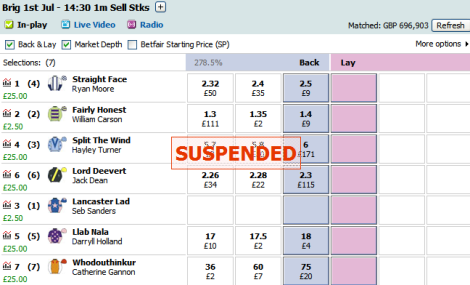 Scenario 2 - What actually happened in this race was two horses traded through the price during the race. Fairly Honest looked the likely winner two furlongs out but got tired in the closing stages and was collared by Lancaster Lad. 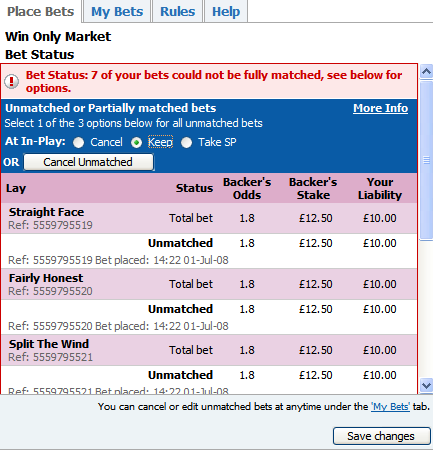 You have now laid two horses to lose £10, with stakes of £12.50 on each one from the backer. As the stake from the other bet (£12.50) was greater than the risk (£10), it makes no difference which of the two horses won – either way you profit £2.50. Scenario 3 - Even better, three horses trade through the price during the race. On the winner you will lose £10. On the two beaten horses you will win £25 (£12.50 x 2). And so on.......the more that trade through the price the more you will profit from the market. Another angle on this trade is to cancel all the remaining lay bets when one has been matched. Taking the above example your maximum profit on the race is limited to £12.50 (the 1st to trade through 1.8 is beaten) while your maximum loss would be £10 (if it goes onto win). Now that you've read the article, try watching the video clip. Other examples on my blog - My favourite trading strategy and another. Read the comments section, plenty of good shared material in there from others who have done a lot more with it.